The crowd hushed as the lights dimmed and the band made their way to the stage. 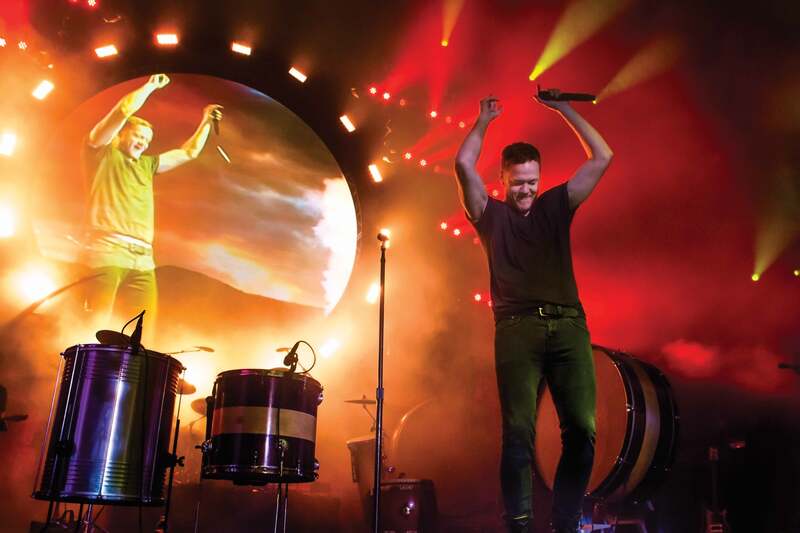 As the lights brightened, so did the fans at the sight of Imagine Dragons.Valley View Casino Center in San Diego, was alive Feb. 15 as Imagine Dragons and their openers ignited the audience with their chart-topping tracks and high-voltage performances. The Naked and Famous felt more like a co-headliner than an opener as the crowd responded with an almost equal measure of fervor. As Imagine Dragons launched into “Fallen,” screams filled the venue. Lead singer Dan Reynolds looked at home as he engaged with the crowd. The audience, ranging from middle-school to middle-aged, engaged right back with the Las Vegas alt-rockers as they sang along and cheered. Several California Baptist University students were in the crowd. Austin Borders, sophomore chemistry major, said he felt the money he paid for his ticket was well worth it. Toward the middle of the set list, Reynolds dedicated a song to his mother and admitted she would be displeased with him performing it. The band began to play “Tom Sawyer” by ’80s Canadian progressive-rock band Rush, and the older generation present, along with Borders, went wild. Not only do Imagine Dragons boast a distinct sound, but they effortlessly performed a classic rock song that was even appreciated by diehard Rush fans. Reynolds expressed gratitude to the loyal fans in attendance and talked about how far the band has come. The crowd was completely absorbed in the performance, and the band drew that energy from the crowd. They ended their performance with “Radioactive,” their ubiquitous radio hit-turned-crowd singalong. After the song ended, the band left the stage and left the audience wanting more, as echoes of “encore” rang out. They came back for an encore, in which they brought out Dave Keuning from The Killers for a guitar solo.